FRANKLIN, Mass. – Facing a 4th and 6 at the Milford 24 yard line in the final minute, Franklin head coach Brad Sidwell had no doubt on what he was going to do. He sent his offense back out — but there was no play. They attempted to get Milford to jump offside, but the end game was always a field goal. 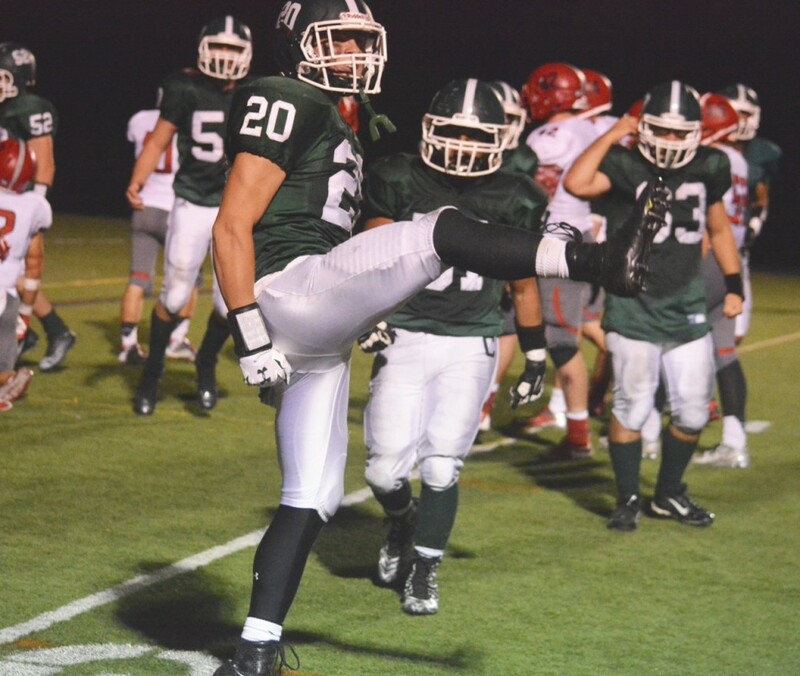 The snap from senior Will O’Reilly was on the money, junior Alex Cregg got the ball set up perfectly and senior Nick Yelle split the uprights for a career-long 41-yard field goal to give Franklin a 24-21 win over Milford in the HockomockSports.com Game of the Week. Yelle had missed a field goal near the end of the first half but showed no signs of nerves as he drilled the kick right down the middle with just 24 seconds left. Yelle rightfully credited the Panthers defense for the opportunity to kick his first game-winning field goal. Milford went three and out twice inside the final eight minutes. Franklin trailed 21-7 in the third quarter but were able to rally back. Down just one score in the final quarter, junior quarterback Brad Jarosz kept the ball on a designed keeper and scampered 16 yards to tie the game at 21 with 8:04 left. On Milford’s ensuing drive, the Scarlet Hawks picked up six yards on the first two downs but an incompletion on third forced a punt. 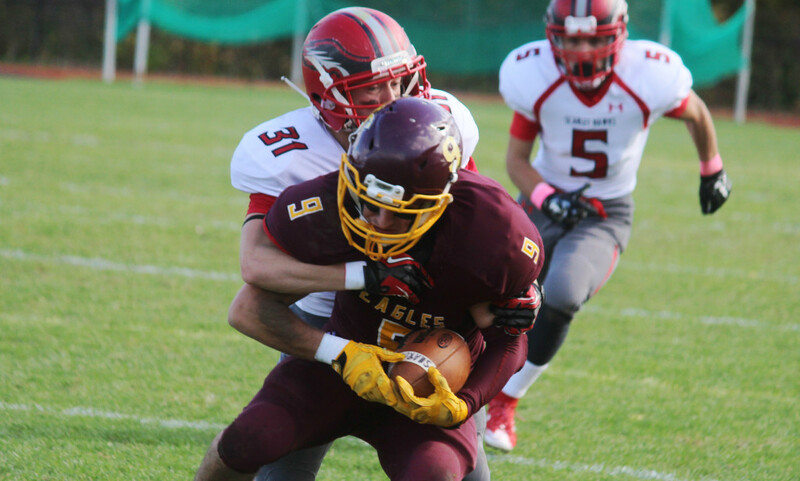 It looked like Milford was going to get the momentum back as Leo Moronta had a big pass breakup and Ryan Nesta and Ryan Gray combined for a sack on third down to get the ball back, but Milford once again went three and out. A holding call put Milford into a 2nd and long situation and after a four yard rush and an incompletion, Milford punted again. Starting at their own 50 with under three minutes to play, a penalty negated a positive play and pushed Franklin back a yard. On first down, junior Jake Wolowacki rushed for 11 yards and then a rush from Wolowacki and Khyler Colella got Franklin a first down at the Milford 28. After an incompletion, a Jarosz keeper and a run from Wolowacki, the Panthers were faced with 4th and 6. That’s when Yelle split the uprights. Milford took leads at 7-0, 14-7 and 21-7 but were unable to hold on. The Scarlet Hawks opened the scoring on their first drive of the game. After the defense forced Franklin into a punt, senior quarterback Zach Lanzetta drove Milford 74 yards on 10 plays into the end zone. Highlighted by an 18 yard run from Jack DeSantis and a 21 yard toss and catch from Lanzetta to Moronta, the Scarlet Hawks made their way into the red zone. Two straight negative plays forced Milford into 3rd and goal from the seven yard line but Lanzetta floated one into the corner of the end zone that junior Blake Hill reeled in with one hand for a touchdown. Franklin tied the game up on their ensuing drive. It took just three plays to travel 74 yards for the Panthers. On first down, Jarosz hit Luke Gordon for a 38 yard gain and then two plays later, Wolowacki bounced off a couple of tackles to break a 32 yard touchdown run. Milford punted on its next to drives while Franklin turned the ball over after a missed field goal and then on downs. It wasn’t until the final seconds of the first half that Milford found the end zone again. Lanzetta drove the Scarlet Hawks 79 yards on 10 plays to score just before halftime. Lanzetta connected with Hill three times on the drive for 48 yards before DeSantis took a sweep to the right and punched it in from six yards out with just 19 seconds left. Milford doubled its lead right out of the gates in the second half. This time it took 13 plays for the Scarlet Hawks to cover 82 yards of ground. 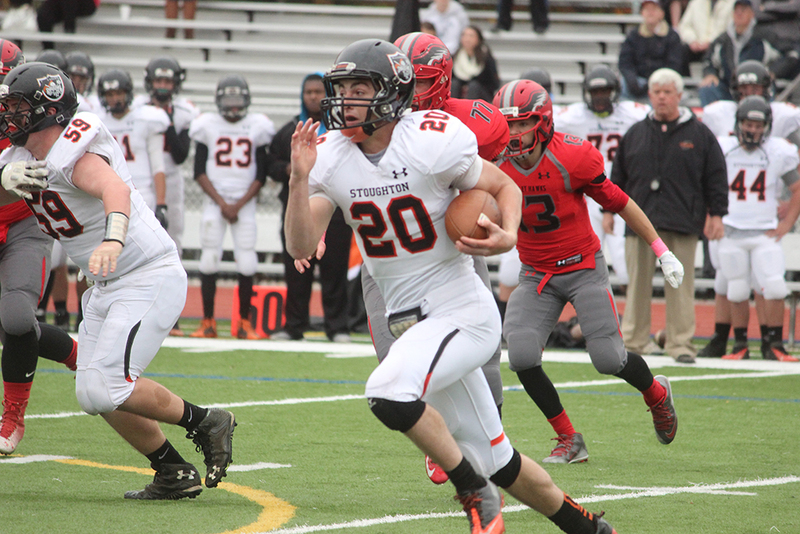 Lanzetta hit Moronta for 13 yards and then a trio of runs from Hill went for 26 yards. Facing 4th and 1 from the Franklin 24 yard line, Lanzetta’s QB sneak went for 10 yards and a first down. Three plays later, Lanzetta kept it himself and rushed to the right for a four yard touchdown to make it 21-7. Franklin’s ensuing drive nearly ended just as quickly as it started but on 3rd and 9, a pass interference call gave Franklin some life. Three plays later, Jarosz floated one out that O’Reilly went up to grab with a defender all over him to gain 42 yards. Two plays later, Jarosz went back to O’Reilly and found him along the right sideline for an 18 yard touchdown to bring the Panthers back within one. Sidwell said after that O’Reilly’s first catch “absolutely” gave him confidence to go back to him, noting how good the plays were that he made. Milford couldn’t get the offense in gear on the ensuing drive, handicapped by the fact they started at their own three yard line. A rush for no gain followed by a throw that was broken up by Gordon and then another incompletion forced Milford into another punt. Starting at Milford’s 37, the Panthers used just five plays to tie the game. Four straight rushes from Wolowacki went for 26 yards. On the fifth play, Jarosza took the designed keeper up the left side and into the end zone to tie the game. Wolowacki led all players with 129 yards on 21 carries, averaging over six yards a carry, and a touchdown. Jarosz finished 9/14 for 140 yards and a touchdown and had 28 yards on the ground with a touchdown. Wokolacki had a team-high four receptions for 23 yards while O’Reilly hauled in three passes for 63 yards and a touchdown. For Milford, Lanzetta went 11/23 for 128 yards and a score and had four carries for 19 yards and a touchdown. Jack DeSantis had 15 carries for 75 yards and a touchdown and Blake Hill had six receptions for 66 yards and a touchdown and six rushes for 26 yards. Franklin (1-1) will look to win back-to-back games when they open their Kelley-Rex Division schedule at home against Taunton (0-2). 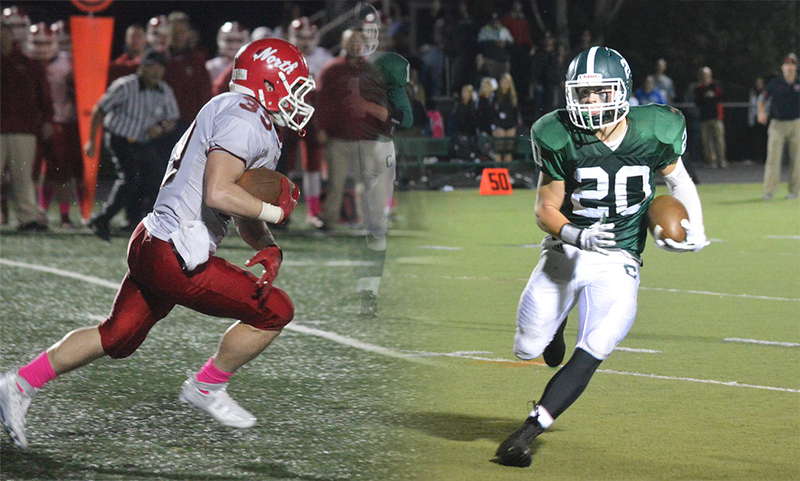 Milford will look to get back into the win column with a trip to Canton to open their Davenport Division schedule.